Luxury candle designers Owen Drew have created a duo of unusual fragrances to honour Shakespeare’s young lovers Romeo and Juliet, designed to burn simultaneously. The star-crossed lovers have been immortalised in the stunning new Montague and Capulet candles which have been designed to burn in partnership, using a perfect symmetry of scents. Inspired by the tale of true love at any cost, the Juliet inspired Capulet candle has been created using essence of Belladonna, the poison she drank to make herself appear dead on the eve of her forced marriage to Count Paris. Part of the deadly nightshade family the substance was widely used as a sleep aid in Medieval times. Romeo’s Montague candle uses notes of Italian truffle oil and wild Italian herbs native to the region where the story is set. Owen Drew founder and Creative Director Drew Cockton commented, ‘I had been researching famous lovers from across history and the tale of Romeo and Juliet really resonated with me. Its such a tragic tale but also an amazing account of finding true love against the odds. We are known for using some of the globe’s most unusual fragrances here at Owen Drew and so the challenge of blending deadly belladonna and subtle truffle notes into an exquisite pair of fragrances became a bit of an obsession over the past year or so. 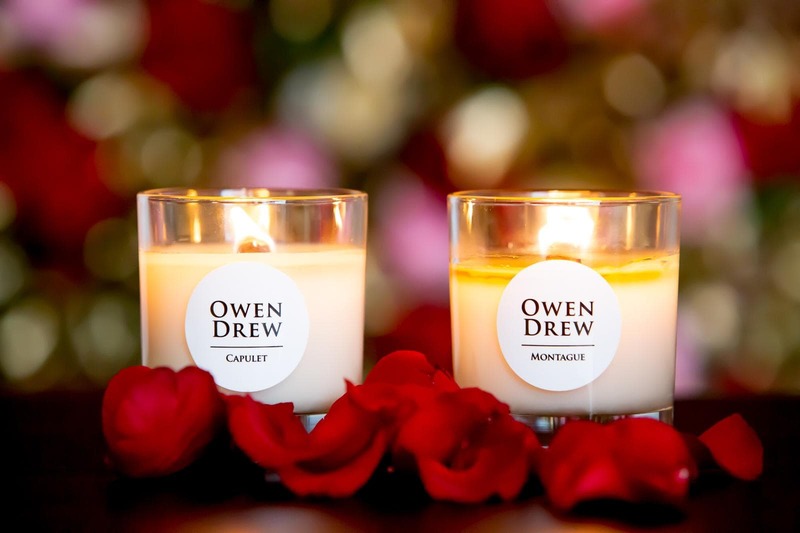 Owen Drew Luxury Candles, who are based in Merseyside have taken the designer candle market by storm since they launched just two years ago. Founded by Drew and his partner Mike Skeggs, the pair have created an award winning collection of scents which have fans across the globe including a number of high profile celebrities including Paris Hilton and even Buckingham palace. The Montague and Capulet collection is the latest addition to their growing portfolio of luxury fragrances which are all hand-made using 100% vegan soy wax in their Wirral based workshop.